Beautiful Waterfront custom built home on the Lower St. Joe river . This home was built 20 years ago and needs updates but will be well worth it! The fenced in oversized front yard makes a playground for children or family pets. Steps walk you down to your private pier. The property also has an extra two car detached garage. As you enter the property from the rear of the house you pass thru the mudroom/ 1st floor laundry area and enter the main floor living area with vaulted ceilings and take in the breathtaking views. So many Pella windows in this home that you can view the river from just about every room in the house. The split floorplan allows for the Master EnSuite to be on the mainlevel . The rest of the bedrooms are upstairs . One room has washer and dryer hookups in the closet in case you want to have 2nd floor laundry. Almost all bedrooms are connected to their own personal full bathroom . The seller has agreed to hold $2000 back in escrow for carpet updates . Want to entertain? The walkout basement has a full bathroom with garden tub and custom tile work. The main space is partially finished just waiting for your personal touches. 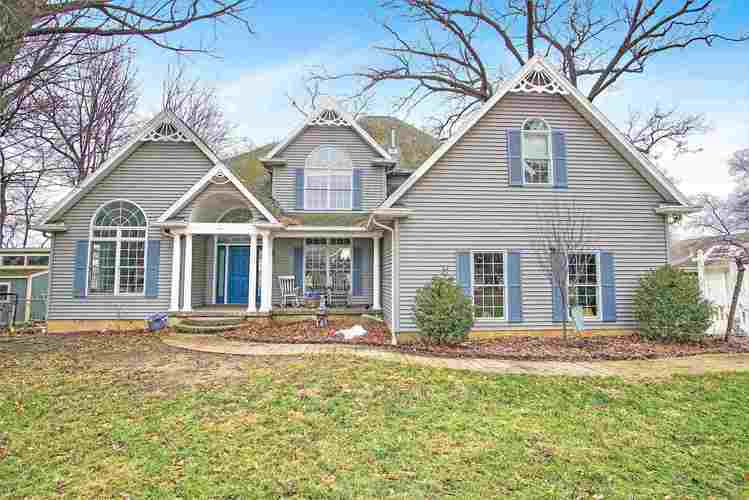 Some work on the walkout basement would make this home a dream. If you want to do laundry down stairs, there is yet another hook up for washer and dryer. Both garages are heated and equipped with electrical. Schedule your private showing today. Pre Approved Buyers only. AHS Home Warranty Included. Seller is motivated and willing to entertain all offers. Directions:Bittersweet to Jefferson. East on Jefferson past Penn High School and property is on the right before Ash Rd.